A while back I talked to Dustin from Skeleton Head Records out of Boston. 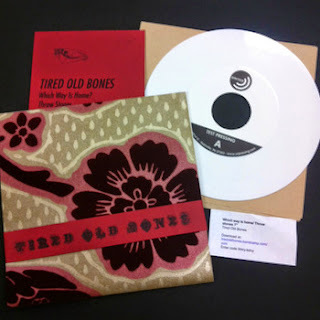 He had just put out his first single from Tired Old Bones and the screen printed sleeve was incredible. there's nothing like that gritty thick feel of ink on recycled card stock, it's like ultra fine sandpaper you can feel the ink coating your finger every time you pick it up. Nothing is as DIY as printing something like that with multiple passes squeegeeing screens. Dustin has since built his own printing studio and released a second single from the Allston, MA band. "Which Way is Home" creates a stabby bopping hammond line for the guitar and drum punches to deliver multiple hits you didn't see coming. Rumbly bass slides up the neck in those dramatic pauses and Bridget's vocals are in complete control like Marvel on the Piñata Records split with Southside Desire and Black Diet. It's one of those vocals that sounds like it comes naturally…it's been trained and nurtured, but the foundation was always there. This unwieldy hobbled together contraption is stumbling along balanced like an alien interpretation of the Decemberists and White Lung. Her delivery ignores the choppy post punk guitar for the most part comfortable with carving out it's own path in this carnival sounding ska. It's building to an epic chorus though and it's in that contrast that this takes unique unexpected turns. B-Side's "Throw Stones" opens on an ominous slow, quiet electric melody that blows wide open with heavy hitting percussion in tons of space, real dusty lonesome west modern country stuff, like Tracy Shedd or GIant Sand. Bending chords to palming the vibrations into strangled scrapes, they work at pushing the dynamics of this one. From hardly a whisper to the birds eye aerial shots at the credits Bridget's got help of some pretty extreme delay in places with some of that smokey lower end Stevie Nicks sound getting down to the serious business of taking control. She's lying in wait like Rid of Me letting loose on the next verse with doubled up vocals while the band makes sure this muscly blues stays on track. "...individually cut from flocked wall paper, with hand cut, printed belly bands. They're on white vinyl and numbered in an edition of 30 housed in a brown paper sleeve. The second press is of 300 numbered white vinyl, housed in black sleeves with exquisite 2 sided inserts and download codes. The covers are embossed and printed with clear glossy ink on matte black paper. Really black on Really black. Not the best marketing ploy but it looks so good in the right light"